By the year 2020, around 350,000 to 800,000 passengers daily can experience a fast, convenient way to travel back and forth between North Avenue, Quezon City and San Jose Del Monte, Bulacan. 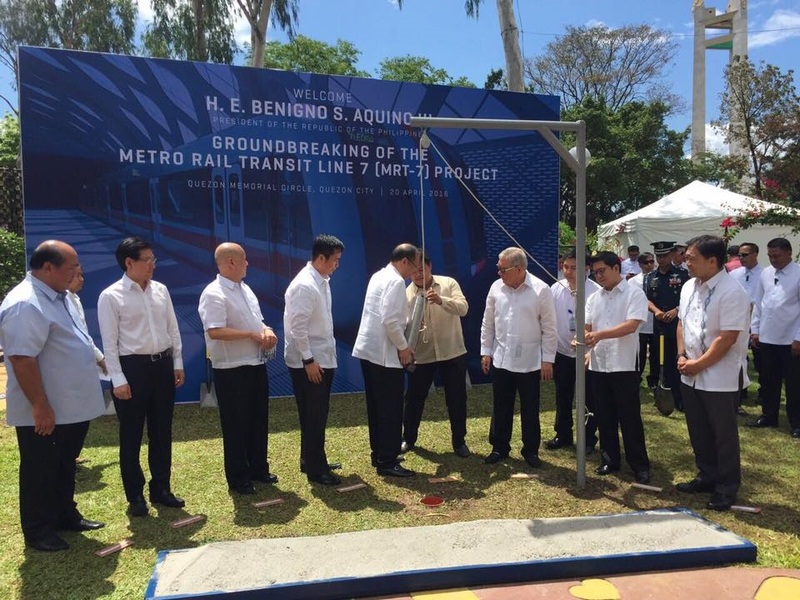 Manila, Philippines–The construction of the Manila Metro Rail Transit System (MRT) Line 7 has officially started today, April 20, which kicked off with a groundbreaking ceremony at the Quezon Memorial Circle graced by President Benigno Aquino III, together with the Department of Transportation (DOTC) Secretary Jun Abaya and San Miguel Corporation (SMC) President Ramon Ang, the project proponent. 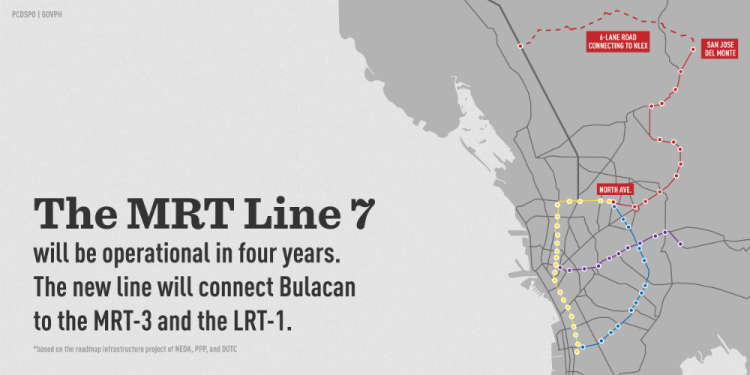 The building of the new transport system aims to shorten the travel time between North Avenue in Quezon City and San Jose Del Monte in Bulacan. “Kapag natapos po ang proyektong ito, 350,000 pasahero kada araw ang tiyak na mapapaginhawa ang biyahe…Ang biyahe mula San Jose del Monte hanggang sa Makati, na umaabot ngayon sa tatlo’t kalahating oras, magiging isang oras na lang,” President Aquino said in his speech. Worth P69.30 billion, the 23-km rail line is made up of 14 stations: North Avenue, Quezon Memorial, University Avenue, Tandang Sora, Don Antonio, Batasan, Manggahan, Dona Carmen, Regalado Highway, Mindanao Avenue, Quirino, Sacred Heart in Quezon City, Tala in Caloocan, and San Jose Del Monte, which is known for its suburban lifestyle and steadily growing economy. Besides the construction of the MRT Line 7, the multi-billion infrastructure project also covers the development of an intermodal transport terminal adjacent to the station in San Jose Del Monte. Here, commuters can ride public utility vehicles (PUVs) or private cars and use the new highway from the North Luzon Expressway (NLEX). “If implemented, makakasakay ako d’yan. I think it will save me a lot of time na p’wede kong magamit sa iba pang bagay. Kapag sa bus, siksikan, para kang sardinas sa lata,” a commuter from Bulacan said.